Trump tries to ignore controversy while stumping in Wis.
Donald Trump said Wisconsin will be key. 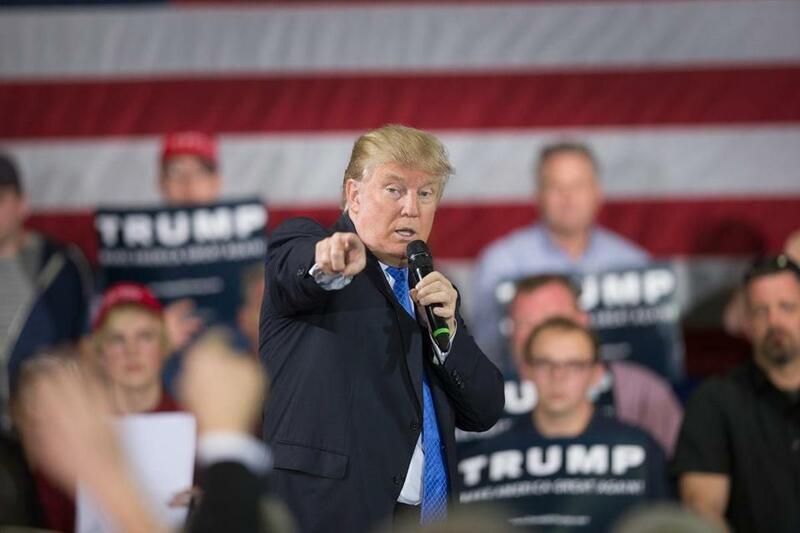 BROOKFIELD, Wis. — Donald Trump tried to focus his campaign Tuesday on Wisconsin, where he was making his first visit ahead of its key primary as controversy cast yet another shadow over his campaign. Trump told supporters at a rally in Janesville that ‘‘if we win Wisconsin, it’s pretty much over,’’ noting his significant delegate lead over rivals Ted Cruz and John Kasich. But he arrived in the state fending off another controversy that eclipsed both his message and that of his Republican and Democratic rivals alike, all of whom converged on the state a week from the pivotal vote. The news overshadowed Trump’s efforts to make gains in Wisconsin ahead of its April 5 primary as Cruz lured support from some of the state’s most influential voices. Governor Scott Walker, a former GOP presidential contender, endorsed Cruz Tuesday, saying that he was backing him because he believes the Texas senator is best positioned to win the GOP nomination and defeat presumed general election rival Hillary Clinton. Cruz told supporters outside Milwaukee on Tuesday that Walker’s ‘‘heroic’’ battle with unions inspired him and millions of others. The Texas senator called Walker a ‘‘strong, principled conservative’’ and noted that he won three elections over four years. Walker defeated a recall election in 2012 spurred by his push to all but eliminate collective bargaining for public workers. The race could be pivotal in the Republican contest. Trump leads Cruz in the delegate chase, where Kasich lags in a distant third place. Should Cruz win, it would narrow Trump’s already tight path to the nomination and raise the prospect of a contested convention in Cleveland this July. Also campaigning in Milwaukee was Clinton, who vowed to curb gun violence. Her campaign forum grew emotional as family members spoke of losing children. Clinton said she will ‘‘keep talking about this throughout this campaign’’ and will ‘‘keep talking about it and acting on it’’ if she wins the White House. Her rival, Bernie Sanders, zeroed in on voter identification laws at a town hall in Appleton, saying they have been making it harder for people to participate in the political process. Wisconsin’s voter ID law, which went into effect this year, is one of the most restrictive in the country. Supporters say it helps guard against election fraud. All three Republicans, Clinton, and Sanders were scheduled to participate in an event in Milwaukee Tuesday evening billed as a town hall-style meeting, sponsored by CNN.